We scoured the market and found the best built safety pool cover on the market and we back it with a 18-Year Warranty. Only the most rugged long-lasting materials go in to our Arctic Armor Safety Covers. 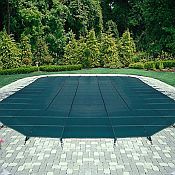 This super strong cover will support your entire family, yet it is light enough to install and remove from your pool in minutes. Our safety cover is made from only the strongest, most durable materials. The cover's straps are a double thickness running along the top and bottom of the cover giving it the incredible break strength of over 4,000 lbs. Super strong polypropylene mesh and stitching are UV treated to resist rot, mildew, chlorine, and sunlight damage. When in use the cover is held in place with brass anchors and stainless steel springs. When the cover is removed the deck anchors recess flush with your deck. While installed, your children and pets are protected - Arctic Armor tamper-proof design means the cover cannot be removed without its installation tool. Rugged polypropylene mesh is loaded with UV protection for super long life. Tough poly thread resists tearing, dry rot & stretching for a perfect fit that lasts. Super strong stainless steel and brass anchoring system will not rust or corrode. 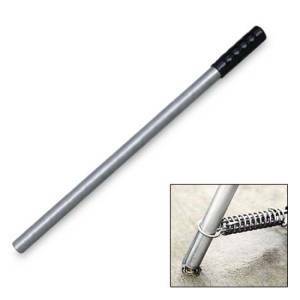 Unique tamper-proof design cannot be removed without special installation rod. Besides being an excellent safety cover, Arctic Armor provides excellent winter protection. The fine, lightweight mesh allows rain to seep through, but screens out leaves, twigs, and other debris. Spring clean-up is quick and easy since no water collects on the cover. The Arctic Armor mesh safety cover comes complete with brass anchors, stainless steel springs, installation tool, and rugged storage bag. It is backed by a 18-Year Warranty. Available in blue, green, grey or tan mesh. 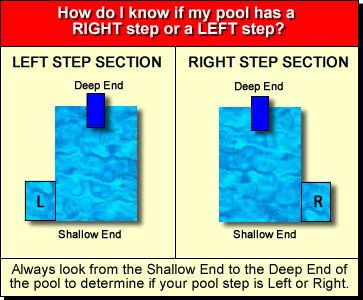 PLEASE NOTE: Any Safety cover with a step other than 4'x8' centered in the shallow end or flush on the left or right is considered as custom and IS NOT RETURNABLE. Your cover will come with approximately 20 anchors and an additional 2-4 anchors if you have a step section.